Judy O’Shea recently published a memoir of her experience running an artist-in-residence program in France for 17 years (see www.water-paper-stone.com (link is external)). 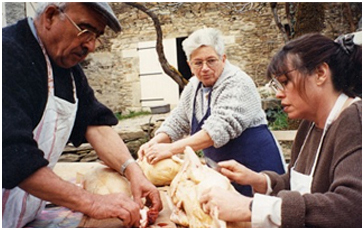 The heart of Judy and her husband Mike’s residence program was the group of artists, American and French, who came together to work at La Pilande Basse, an 18th-century watermill in the Aveyron region of southern France that Judy and Mike restored as a base for art. Judy came up with the idea to create an artists’ book version of her memoir as a full-scale exhibition at the San Francisco Center for the Book. The scale of the exhibition would allow the viewer to wander through an enormous book: 15-foot covers, a 20-foot spine, and pages hanging from the rafters. The primary structure of the book would be constructed with paper that Judy makes by hand at her Inverness, California studio. Judy invited 17 artists (10 American and 7 French) to contribute the “pages” for this special artists’ book. The pages are as varied as the artists, but are all originally conceived for the site, and have a special dialogue that comes from collective experiences. The author, Judy O’Shea, learning how to cut up ducks for confit and fois gras. Germain Blanc, who was born in the mill, and whose father was the last miller, and his wife, Marthe, guided Judy and Mike throughout their experience in France: cooking, grinding flour, gardening, and even making Roquefort cheese.